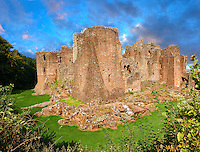 Images, pictures & Images of the medieval Norman Goodrich Castle, Herefordshire England. Built by the conquering Normans in about 1101, Goodrich Castle controlled an important crossing over the River Wye known as the Walesford crossing, located between Monmouth and Ross-on-Wye. Originally a wooden fortification in the 12th century it was rebuilt out of stone probably by Godric of Mapplestone, from whom the castle takes its name. 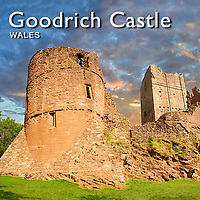 Goodrich castle was designed to be an impressive fortification with luxurious living quarters inside. The end design was so successful that it was copied by other Norman castles in England. At the centre of Goodrich Castle is a Norman keep which is surrounded the high outer walls of the castle, built in the 1280s,which has towers on three corners. The fourth corner has a gatehouse that is modelled on the one at the Tower of London. A high causeway crosses the moat at the end of which is a draw bridge and a portcullis, protected by a barbican. The round towers have long stone spur buttresses built into their sides. This was a device to stop the towers collapsing if they were undermined by attackers and is typical of the castles in the Welsh Marches.